Momentum behind the Personal Health Investment Today (PHIT) Act continues, as 24 members of the House and Senate have signed on as cosponsors in the two weeks since it was introduced. PHIT remains bipartisan, with 13 Republicans and 11 Democrats joining the lead sponsors—Senators John Thune (R-SD) and Chris Murphy (D-CT) and Congressmen Ron Kind (D-WI) and Mike Kelly (R-PA)—in supporting this pro-activity, pro-health bill. The PHIT Act passed the House in July 2018 but failed to receive a vote in the Senate before they adjourned for the year. 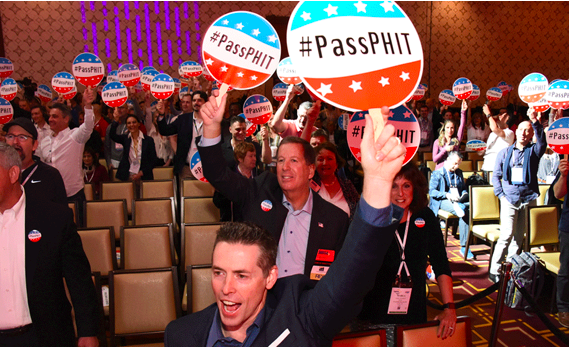 The Sports & Fitness Industry Association launched the cosponsor drive the day after PHIT was introduced in House, during National Health Through Fitness Day. On March 13, the Sports & Fitness Industry Association (SFIA) hosted celebrity athletes, sports and fitness executives, medical professionals and active lifestyle advocates on Capitol Hill to address the need to help families with youth activity expenses. Attendees spent the day in meetings with members of Congress, promoting the PHIT Act and providing information on the far-reaching benefits of an active lifestyle, and how it serves as a disease prevention health measure.